Sadie is around 2 years old. She was an owner surrender due to problems with the resident Chow. Linda Antonelli fostered her. 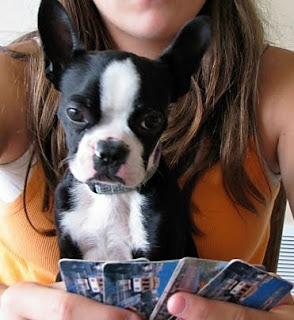 She was adopted by Christine Ullman and family and is their pride and joy. Congratulations to all! What a wonderful success story! Here is a recent picture of Quigley, our 9 month old special boy. He was born with Hypospadia. 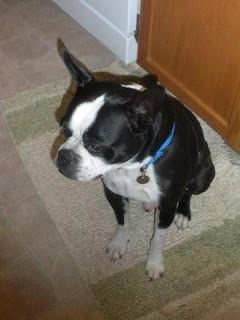 It is a condition that affected his urinary tract and this could not be left untreated. He underwent a series of surgeries to correct this problem and now he will live a wonderful and long life. The only difference between him and the other dogs is he now looks like a girl. Thanks to many friends, and to fabulous loving by his foster mother Heather Krock, Quigley's care was provided, and he now has a bright future ahead. Quigley is ready to be adopted by a forever home. If you are interested, go to the applications page and fill out an application to adopt Quigley. FREDERICKSBURG, Va. -- A dog missing from northern Virginia for a decade may soon be reunited with his owner after showing up in Oklahoma. Tristan Rohde, 8, her family found Brindle under a bush in their Lawton, Okla., neighborhood a couple of weeks ago -- more than 1,300 miles from where he disappeared. The Rohdes thought Brindle was dead, but when he lifted his head, Tristan decided to take him in. "If I didn't, then he would just be sitting there right now with no family, no friends, no nothing," she said. The Rohdes took Brindle, who was near death, to a veterinarian who found a microchip with tracking information under Brindle's skin. "I'm just so proud of my daughter being so caring like she is, taking in the dog that was probably knocking on heaven's door," said Tristan's father, Jon Rohde. 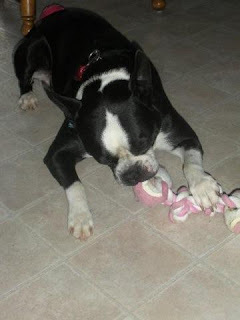 The family then used Facebook to track down Brindle's owner, Gary Rowley. Brindle was a smart dog, Rowley said. He could open doors. "He would hook his toenails into the side of the door and he opened it," Rowley said Wednesday. On Super Bowl Sunday 1999, Brindle opened the door and never returned. 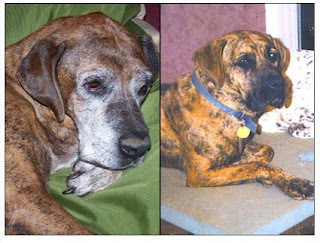 The circumstances surrounding Brindle's disappearance, past 10 years and incredible journey to Oklahoma are unknown. "I'm not mad at the dog," Rowley joked. "All I want to ask him is, 'Why in the hell did you run off 10 years ago?'" The reunion awaits Brindle's recuperation. He's not yet well enough to travel, but if the vet OKs him Friday, Brindle and Rowley could be together again next week. Norman was rescued from a shelter in Philadelphia, just days before being scheduled to be put to sleep. The shelter staff loved him, and contacted the NEBTR, and we immediately picked him up. He is now being lovingly fostered by Amy Jansky. "Here are some photos of Norman. 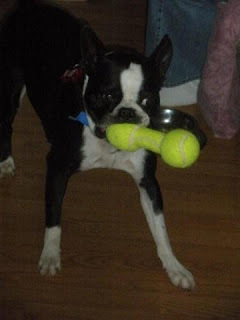 He LOVES tennis balls!! 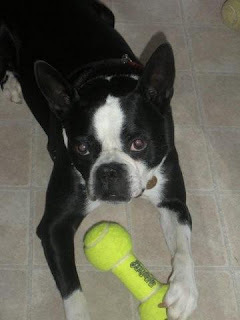 Norman sends love, licks, and heartfelt THANKS to NEBTR for rescuing him!!" Norman, previously days from death, is now available for adoption by a forever home. Just look at that face!